In the past few weeks, I’ve found myself installing and configuring Pianobar a lot. 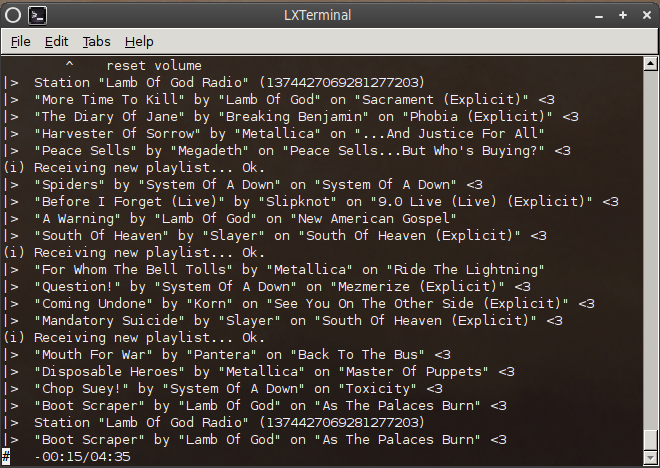 It’s an open source command line client for the popular Internet music streaming service, Pandora. In rebuilding a couple of machines recently, I have found myself installing and configuring it a few times, and I keep stumbling over it, because it’s broken in the Ubuntu and Debian repositories, so in order to get this really great application to work, it takes a few more steps than a quick apt-get install command. This little writeup is at least in part for my own benefit, since I’m sick of the stumbling and trying to remember, wait, what did I do to get this to work again? So if it helps any of my readers out, even better! When I first tried Pianobar, I installed it from the repositories, and immediately found it unusable. I basically got a TLS error when it tried to authenticate when logging in with my Pandora One account, and as of the time of the writing of this, that is still the case. Further research indicated that this was an issue with the version in the repos, and the only way to get around this was to build it from source. No problem. I might be doing the lazy thing by running things like Mint and other Debian based distros these days, but hey… I spent 8 or 9 years running Slackware as my main distro, so I’m no stranger to compiling things from source! Still, this is a bit twitchy to configure, which is why I’m writing this. Ready for a little command line action? Good. The first step here is to install Git, if you don’t already have it. If you need to compile Git from source, or install it with a different package manager, you probably already know how to do that, so I’ll just move on to the next step. Just so you know, this will create a “pianobar” subdirectory in whatever directory from which you run this. Finally, you need a config file. In your home directory, under .config, if there isn’t one already, create a pianobar directory, and put an empty text file called “config” in there containing this text. Pianobar is run simply by typing pianobar into a terminal. I actually like to run it from one of my virtual consoles (ctrl+alt+f1, for example) so that it isn’t even taking up a window on my desktop. I posted this in last week’s laptop rebuild post, but I figure it belongs here too. Pianobar in all its command line glory! I’m not going to do a full rundown of how to use pianobar; if you got this far, you can figure that much out from here. Hint: hitting the “?” key will pretty much give you all you need. Then it will log in automagically every time you run Pianobar. I keep getting error: listener not authorized. What am i doing wrong? Not sure if you figured it out but just delete the block that starts with “high-quality audio” if you’re not a Pandora One subscriber and it will work! Jeez… I’m a Pandora One subscriber, so I hadn’t even considered that. Good comment! As a long time Pandora / Pithos user I recently had the need to run pianobar on a Raspberry Pi. For the ~/.config/pianobar/config file I only needed the user and password, none of the other partner or tls stuff. My pleasure, thanks for the comment! I have multiple pandora accounts (1 for music and 1 for comedy) and i got tired of changing the config file each time to switch the accounts. So, I created a bash function to handle this for me and created a copy of each account config file and named them music and comedy, respectively. Im sure if you use a different shell you can figure out how to use the same format to do the job. and in terminal i have 3 options.. if i type pianobar it uses the last config used. If i type pandora comedy, it plays the comedy account and If i type pandora music it will play the music account. That’s really cool, I would never have thought of doing that. Thanks for the comment, I’ll be coming back to this when I try it out! I keep getting an error that eventcmd cannot be found. However, it’s there. Also, I am continuing to get the TLS error. I am on build 2012.05.06. Any thoughts as to where I’m going wrong? I’m working on Raspbian, and am very new to it, but have some programming experience. Any input would be appreciated. On my Raspberry Pi, I got compile errors because I was missing libavcodec, libavfilter, libavutil, and libavformat. Once I apt-got the -dev files for those, I was able to compile. I’ve been working on this off and on for a few weeks, been to several web sites, tried lots of different settings learning new things with each one. But the instructions in your blog helped it all come together and I now have music streaming from Pandora through my Raspberry Pi for the first time today! Thank you very much for this post! Okay, I’m having a bit of a head scratcher. I installed Homebrew and Pianobar on Mac OSX Yosemite. It works great! But I’ve been trying to find the config file and can’t. There’s no config file located at ~/.config/pianobar/config. There’s no pianobar folder either. Any thoughts? Add your configuration info, save and you’re all set! I can’t get the config file to work. I think it’s because I can’t find my .config folder. It wasn’t even there when I tried to view hidden folders and I can’t do the “Go to folder” in Finder because it can’t find it. I made one and made the pianobar folder in there then put the config in but it doesn’t work. Any ideas? Mac OS X 10.11 BTW. Never tried this on Mac OS, but I would suggest creating the .config folder if it doesn’t exist already. Then, under that, create the pianobar folder to contain the config file I described above. works great, definitely us PGP or some other mechanism (don’t know what is allowed or supported) to encrypt your passwords on your hard drives. Pianobar still seems to be commercial free, Thank God!, and hope it stays that way.